(March 15, 2011 – New York, NY) New York City’s longest running and most successful boxing series, Broadway Boxing presented by Coors Light, returns March 29 to the most intimate venue for boxing in the country, the BB King Blues Club in Times Square. In the main event, José Pedraza, who turned pro in his last fight in his native Puerto Rico, returns to the ring. Tickets for Broadway Boxing are on sale now through DiBella Entertainment, and start at only $55. Tickets can be purchased by calling DiBella Entertainment at (212) 947-2577. Those scheduled to see action on the undercard include several of the most popular and exciting pugilists that the New York fight scene has to offer, such as junior welterweight Willie Monroe, light heavyweight Seanie Monaghan, and junior middleweight Delen Parsley. In addition, lightweight Scott Burrell (2-0, 2 KOs), and super middleweight Travis Peterkin (1-0, 1 KO), both from Brooklyn, will face opponents to be named, as well as junior welterweight Gabriel DaLuc, of Quincy, MA, making his pro debut. Pedraza (1-0, 1 KO), 21, after a stellar amateur career, is already poised to become the next boxing superstar out of Puerto Rico. 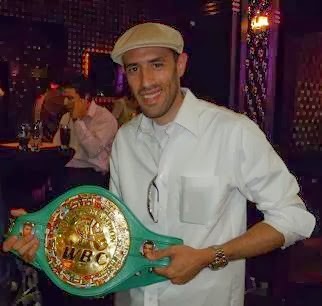 Highlights of Pedraza’s amateur résumé include competing in the 2008 Olympic Games, winning a gold medal in the Central American and Caribbean Games in 2010, silver in the World Amateur Championships in 2009 and the 2010 Pan American Championships, and bronze at the 2007 Pan American Games and the 2008 Boxing World Cup. Pedraza professionally debuted as a junior lightweight with a TKO1 over Felix Rivera on February 18, at Coliseo Pachin Vicens in Ponce. Although only one fight into his professional campaign, with his amateur pedigree, it won’t be long before Pedraza is in contention for a world title and is sought after by the major networks. Monroe Jr. (10-0, 4 KOs), 24, has had boxing in his blood from a young age. His father was a middleweight contender in the 90s, and his great uncle was the famous middleweight contender out of Philadelphia, Willie “The Worm” Monroe. Three years into his pro career, he has been carrying on the tradition nicely. In his last bout, Monroe, who lives and trains in Rochester, stopped then 6-2 Mickey Scarborough inside five rounds. Monaghan (6-0, 4 KOs), 28, a brick layer out of Long Beach, NY, carries the luck of the Irish each time he steps into the ring. Although he did not have much amateur experience, with only 15 bouts, Monaghan was able to reach the finals of the New York Golden Gloves tournament before turning pro last May. Making up for lack of an amateur background, Monaghan is keeping a busy schedule as a pro, and will be fighting for the second time this month when he steps into the ring at BB King Blues Club on March 29. In his last fight, Monaghan outclassed Billy Cunningham over four rounds, winning a unanimous decision on the Martinez-Dzinziruk undercard. Parsley (4-0, 2 KOs), 23, of Brooklyn, NY, is a former amateur standout and son of famed Gleason’s Gym trainer Delen “Blimp” Parsley, who doubles as his trainer. Standing at 6’2”, Parsley used his exceptional height to his advantage in winning a four-round unanimous decision over Eberto Medina in his Broadway Boxing debut on December 1. Tickets for Broadway Boxing are on sale now through DiBella Entertainment, and start at only $55. VIP Ringside tickets are $125, Floor Seat tickets are $75, and General Admission tickets are $55. Tables for groups of 5 are also available. Tickets can be purchased by calling DiBella Entertainment: (212) 947-2577, and more information can be obtained by visiting www.dbe1.com. This should be a good night of boxing at BB Kings on March 29 2011. I wanna see if Jose Pedraza has star potential. I think he has and he will show people in NY what he brings to the table. Good to see Sean Monaghan fight a .500 fighter at least. Sean is a talented fighter, but I didnt like the Borngod Washington fight. But Sean is a tough guy. Willie Mionroe has a chance to show NY he more than a former fighters nephew. Kid is a good fighter. Delen Parsley has talent, but does he have a chin? And Travis Peterkin, OH BOY, aka "The Notorious Slicky Tricky Travis Peterkin is also on the card. This kid has more amateur experience than anyone on the card except Pedraza. Love him or hate him this kid is gonna change the game of Brooklyn Boxing with the style he has. If he impresses this kid might have the brightest future compared to his NY buddies who is also on this card. Slicky Tricky Trav is gonna be hell. Scottie Burrell is another Bklyn fighter who will be in the building. Good luck to Burrell.